With a challenge of £50 from Money Supermarket to change the look and feel of a room, I knew it had to be poor Mister B’s. With a three bedroom house, he ended up with the spare room which was stored the computer/daddy’s books/anything else miscellaneous that didn’t have a home in the house! 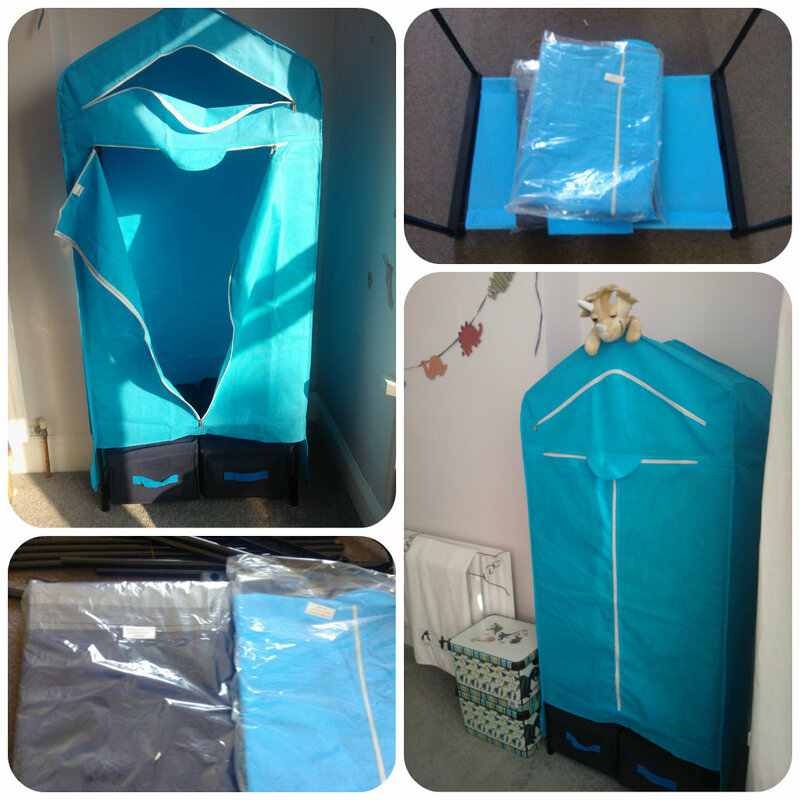 The room is a little L shape and in one part we had the cot and a few plastic storage boxes for his clothes. His toys mostly live downstairs while the other half of his room is an office. 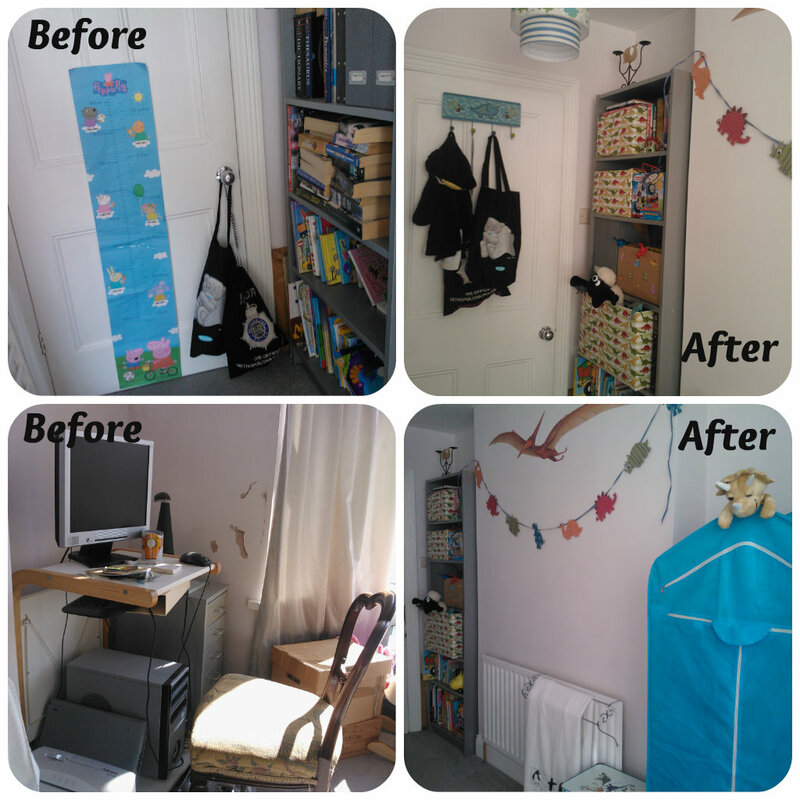 At nearly three year’s old I think Mister B deserves his own bedroom, so with £50 could we change it from an office/nursery to a little boy’s bedroom? Well the bargain buy of the whole project has to be a little fabric wardrobe. Mister B’s clothes have been stored in plastic storage boxes since he was a baby and I picked this up in the sale for £7.49!!! The computer in the corner of the room had become redundant. I only ever use my laptop downstairs now so we cleared away the old computer, desk and filing cabinet to make a space for the new wardrobe. Miss M was very excited and helped to hang all of Mister B’s clothes which was a huge help. 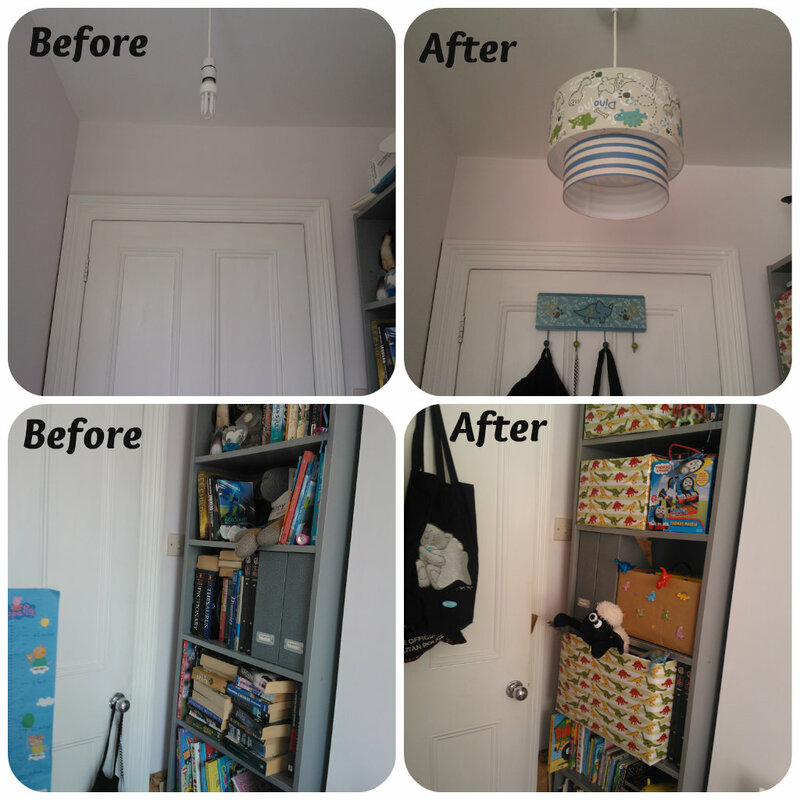 The next thing we tackled was the bare light bulbs and numerous bits and pieces hanging around the door handle. We found a rather nice set of dinosaur hooks and matching lampshade. We also had the problem of daddy’s bookcase. 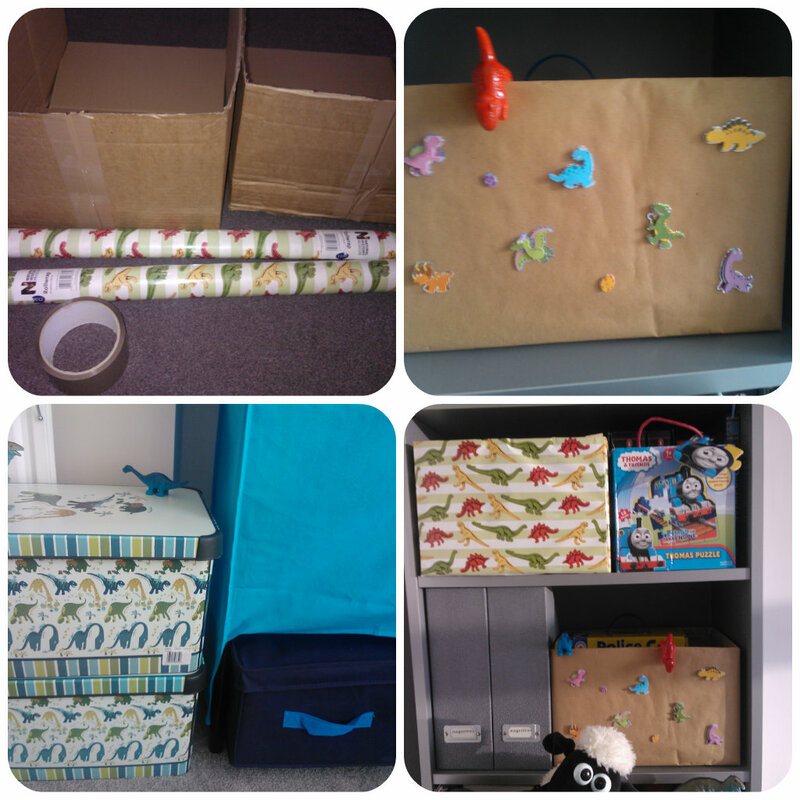 Hmmm, we didn’t really have anywhere else to store them but wanted it to look a bit more like a little boy’s bedroom so we utilised some old cardboard boxes, bought some dinosaur wrapping paper and stickers and made some decorative boxes to hide away all those books and make it look more like a little boy’s bedroom. We also purchased a couple of solid plastic dinosaur boxes to sit on the floor by the wardrobe for Mister B to put his toys in. These should be durable for little hands to open and being pulled around on the floor. So below you can see the changes to each side of the room. 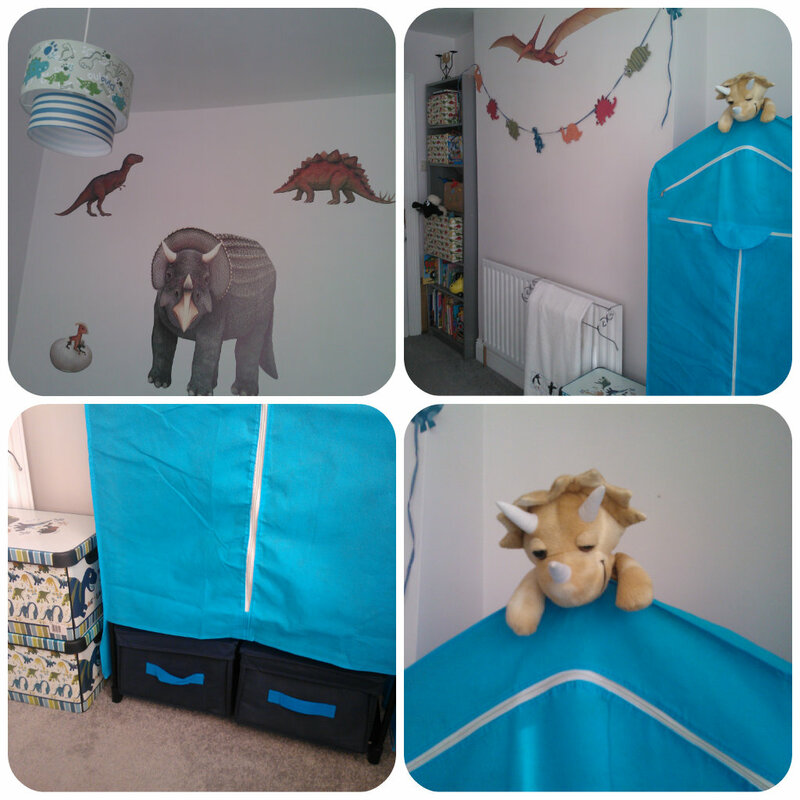 With the walls above his bed having recently had a facelift with some Dinosaur Wall Stickers, it really brought together the whole room and made it a little boy’s dinosaur bedroom. Mister B’s little face lit up when he walked in and saw it – he really feels it’s his room now and not a room a bedroom/office.